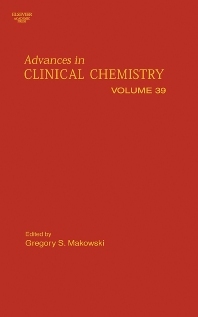 Volume thirty-nine in the internationally acclaimed Advances in Clinical Chemistry, contains chapters submitted from leading experts from academia and clinical laboratory science. Authors are from a diverse field of clinical chemistry disciplines and diagnostics ranging from basic biochemical exploration to cutting edge microarray technology. In keeping with the tradition of the series, this volume emphasizes novel laboratory advances with application not only to both clinical laboratory diagnostics, but as well as practical basic science studies.